…And thus began the film that would make David Bowie a cultural icon in the eyes of children all over the world. Labyrinth, Directed by the late Jim Henson, was a film that every child of the 80’s saw at least once and could easily sing every song by heart. So I am proud to present to you, Labyrinth (1986). Starring David Bowie and Jennifer Connelly, Labyrinth is about a young woman named Sarah (Connelly) who feels put upon by her step-mother and deeply jealous of her step brother Toby. Having to babysit one night, she mistakenly calls upon the Goblin King Jareth (Bowie) to take her step brother away. Instantly regretting it, she makes a deal with the Goblin King to get her little brother back. She soon finds herself navigating an impossible Labyrinth, meeting strange companions and journeying across dangerous landscapes, all the while trying to beat the clock before Toby is turned into a Goblin himself. This is one of the most iconic films of my youth. I remember watching this many times as a kid and even more times as an adult. Bowie himself was in his prime in the 80’s and although immensely popular in music, had done little in the movie side of the industry. So, when approached by Jim Henson for the role, he graciously accepted and help create one of the most memorable of Henson’s non-muppet films. 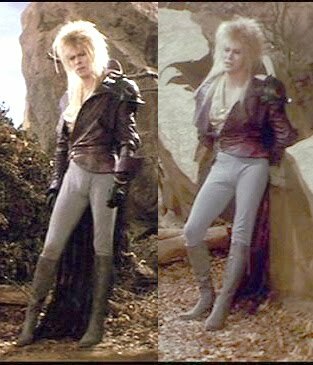 While not much is revealed about the Goblin King himself, you also get the distinct sense that Toby was to be more than just another potential Goblin for Jareth. In fact, the story heavily implies that Jareth may have actually been trying to entice Sarah to run away with him the whole time. Kinda creepy when you think about it, Sarah being a teenager and all… just sayin. As for the story, simply magical. Along Sarah’s journey she realizes that she must depend on others and stop being selfish in order to find her way. It is, at its core, a coming of age story set in a fantastic universe where nothing is as it seems. Throughout the film events that look impossible are in fact the easiest and places that look peaceful and enticing are in fact the most dangerous. Sarah must look into herself to find out what she really wants and who she really is so that she can traverse this clever maze. Once she has made this journey of self discovery, only then can she face Jareth and recover what it is that she lost. All in all it is an incredible film where nothing is as it seems, and if you dig deep enough, you really question if the events actually happened to Sarah or were all just a dream. You see, at the beginning of the film, the keen eyed viewer will find elements of the Labyrinth itself throughout Sarah’s room. Everything from a statue of Hoggle to images of Bowie himself with Sarah’s moviestar mother can be seen implying that this Labyrinth could be a construct of her own mind. Now whether that be imaginary or Magical is really up to the viewer and this fan wants it to have been real. I remember wishing for Hoggle and the rest of Sarah’s companions to come spend time with me as a kid. At the end of the film, Sarah’s friends tell her that they can be there ‘should she need [them]’. I would have killed to have these imaginary characters as friend and, although they never materialized, in a way, they have been with me ever since. One fun note, Although uncredited, Gates McFadden who played Doctor Crusher on Star Trek the Next Generation did most of the dance choreography for this film. She would also do some of the choreography for episodes of STNG as well. This is, by far one of the most magical and memorable films of my youth. To this very day, whenever I hear the opening notes of Trevor Jones’ score combined with David Bowie’s soundtrack, I am instantly swept away to the magical Labyrinth where Rocks are friends and Nothing is as it seems. All of the actors are spot on and the special effects by the magicians from Jim Henson Company still hold up to this day. It is truly one of those films that can be considered timeless. From it’s mild lessons in humility and friendship to the amazing music, this is one that every child should experience at least once in their life. I honestly can not give it any higher recommendation. The sets for the final confrontation are truly astonishing as they use inspiration from MC Escher in a fully realized three dimensional world. I can’t describe the awesomeness so let’s just show you. Plus it has a terrific song from Bowie…because of course it does. It’s Legacy continues to resonate now even over 30 years later, this film still inspires amazing products and continued stories. From incredible Board Games to cool action figures and even comic books, this movie is sure to live on for many more years to come. There is a fantastic 30th anniversary BluRay edition here you can get for around $10. Totally worth it! You can also get it digitally from VUDU here for about the same amount. Sadly we lost David Bowietwo years ago but, no matter what, his own legacy will live on with his films and music. This one is dedicated to the great man himself. Farewell Bowie, we miss you. I loved this movie growing up and I still love it now. Kids adventure story that doesn’t assume kids can’t handle a little bit of danger and real emotional stakes. Not to mention, David Bowie. Yeah, the soundtrack to this one is on my phone and very frequently played. Man. That soundtrack is just too good. The film is a timeless classic for sure. Glad you like it!